We will be happy to help you find out EXACTLY what you have, or what to spend if you're trying to put a run of Spider-Man books together. Reprints of this book exist; to help you identify them, we have examples below. This landmark book has been reprinted more than once. If you have one of the reprints, then unfortunately it's not got a huge value. 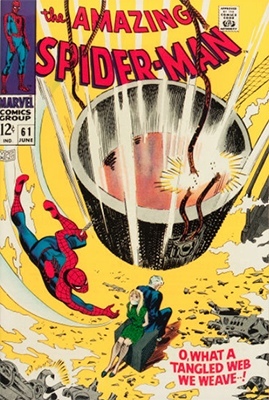 Click any link or image to check the current value of a comic book! 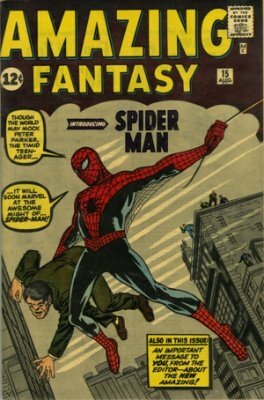 Aside from Amazing Fantasy #15, ASM #1 is the book that every Spidey fan wants to own. 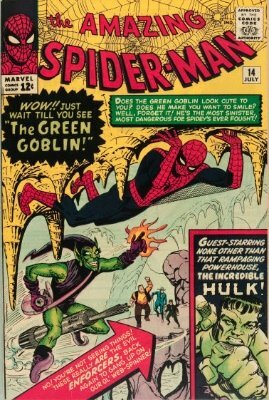 It is truly a Marvel Mega-key, and worth good money in any condition you find it in. Because it's in such demand, there is no "average" condition. On any given day on eBay, a dozen or two of these books will be listed, in anything from ragged, held together with tape examples to higher-end books priced in the five figures. 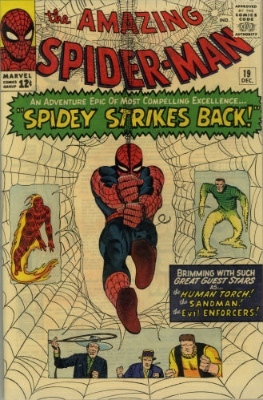 That said, copies of ASM #1 we are offered for sale usually come around the 3.5 to 5.0 mark. They do seem quite scarce in higher grade. It has not gained value as fast as the on-fire AF #15, but affordable examples have appreciated about 25 percent in the past two years. A solid VG example with off-white to white pages should cost around $5,000 now, which may still seem like a bargain in 2026. Amazing Spider-Man #2 is on our 100 Hot Comics list. Click to find out why! If you're looking for an affordable, higher-grade Marvel key issue from the world's hottest comic book series, than Amazing Spider-Man #2 might be your best bet. 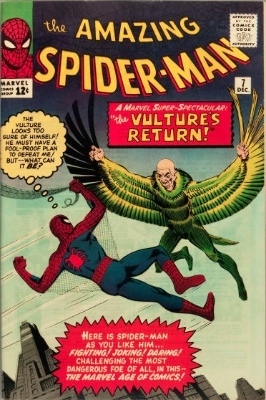 There was much speculation about the Vulture being the next antagonist in the Spidey movie series. Of course, now the Andrew Garfield experiment has been dropped, and Marvel Studios is back on board with Spider-Man, there may be a rethink. 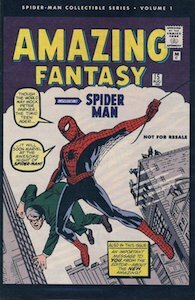 Still, he could well make a bow on the big screen, and arguably a CGC 9.0 of this book is under-valued at around $5,000, given what has happened to other Silver Age Spider-Man comics in the past few years. To put that into contrast, a 7.5 sold in July 2016 for $3,000. Which would YOU rather own? These books show up in all kinds of grades, but average shape is in the 2.5 to 4.0 range. A nice clean 4.0 will cost you less than $1,000. I still think I'd rather hold out for a higher grade book and buy something that will have less competition when it's time to resell. 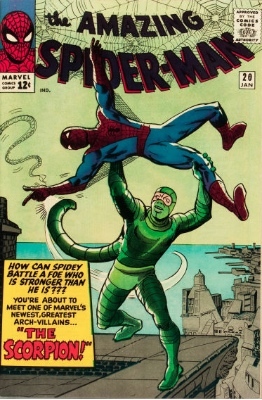 The glory days of Amazing Spider-Man comics continue with ASM #3, the first Doc Oc. Another book which is in constant demand in any grade, we have been offered examples as poor as a 1.0 and as nice as a 9.0 during this year. The average shape of this book, for some reason, tends to be nicer than both #2 and #4, at around 5.0 to 6.5. In that grade range, you have a book worth between $1,200 and $1,500. 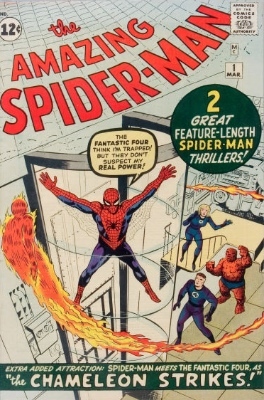 Still, if you're planning to invest in a copy of ASM #3, I'd ask you to look higher up the grade range. A VF 8.0 copy will cost you not much more than $3,000. 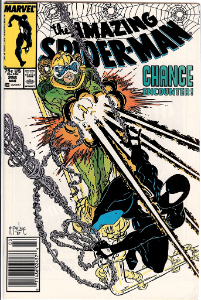 If you think about the difference that can make to a comic book -- especially to a book which presents really nicely from the front but has a 'heart breaker' crease or something on the back -- you have a much more saleable asset when it's time to cash in. 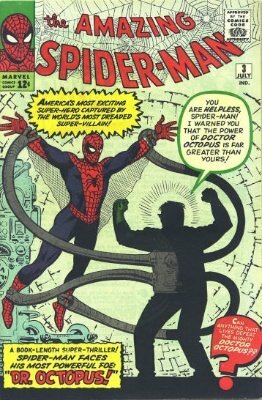 Ultra-cool Spider-Man villain alert! 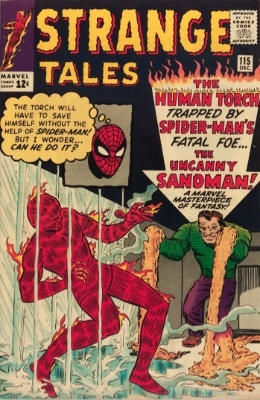 The Sandman, already the antagonist in one of the Toby McGuire Spidey movies, is perhaps one of the under-ultilized bad guys in the Amazing Spider-Man comic stable. This book forever comes into our office in semi-ragged 2.5 through 4.0 shape. The red cover is very prone to showing wear. For whatever reason, it always seems to have heavy creasing across one or both of the front corners. In this kind of average VG-ish shape, it's worth about $300-450 in a CGC holder, but the interesting part is that uncertified examples sell for about the same price! This book seems to be scarcer in high grade. With only three CGC 9.6s topping the census and a further seven copies graded 9.4, it's not a surprise that a VF-NM copy will set you back around $5,000. My tip would be to invest in a CGC 9.2. A lovely high-grade book like this will certainly appreciate, and at around $7,000, that seems like a steal. 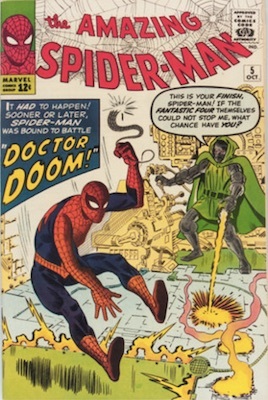 Doctor Doom never hurt the value of a comic book! Here's a truly evil genius who first appeared in Fantastic Four #5. 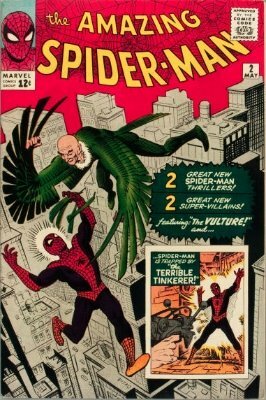 This is a highly desirable early Spider-Man comic book that seldom turns up clean, thanks to the lighter color cover. Average condition of this issue is about 4.5 to 6.0. In a CGC holder, this values the book in the $400-600 range. It may not be worth certifying yours if you have one in this range, as the selling price of a non-certified example is in the same ballpark. 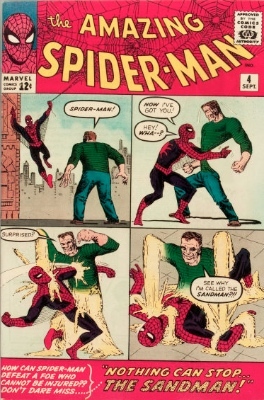 For whatever reason, there are far more higher-grade examples in the world of ASM #5 than there are of #4. There's one CGC 9.8, nine 9.6s and eleven 9.4s. This puts pressure on the prices of high grade copies of this book. There is barely any difference between 8.5 and 9.0 prices, so if you can't afford $6K for a 9.2, I'd spend $3K on a 9.2 and hang onto it for the long haul. 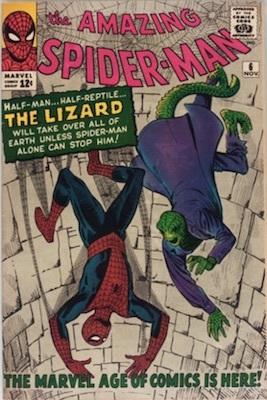 Another Spidey monster who has already enjoyed his 15 minutes of fame is the Lizard. Most copies of this book show up in the VG range, so if that's where yours is at, it's worth from $400 to $500 retail in a CGC holder. Ungraded VG copies will cost you about $300-400. There are lots of copies of this book on the market. The best bang for your buck might be a 9.0. At around $3,000, this is a book which has WOW factor, especially if you're used to looking at semi-ragged VG examples all the time. The right copy with white pages and a beautiful looking front cover will only appreciate. Okay. Here's a tough book in nicer shape. 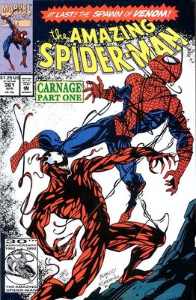 I see better-looking ASM #3s than #7s all the time. I don't know why. The deep blue color of the sky behind the title really shows wear easily. A decent VG copy in a CGC holder will cost you about $200-250 only. There are no 9.8s in the census, but nine 9.6s and 18 9.4s. Shockingly, a CGC 9.6 sold in November 2015 for only $13,000. While this is out of most people's budget ranges, $2,000 or so for a CGC 9.0 should be considered a good deal. That's the lowest I would invest at. Another book that we never seem to get in higher grade. There are plenty of high-grade examples in the census: no less than six 9.8s and 13 9.6s. You can get a CGC 9.6 for around $5,000. 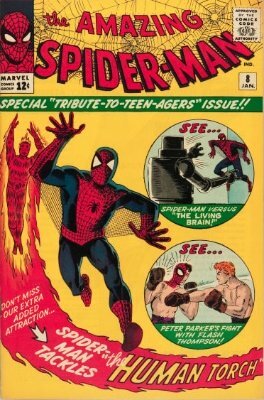 That's pretty cheap for such a high-demand Silver Age comic book series. In the average VG-FN shape they always seem to show up in, they sell in the $200-$350 range in a CGC holder, and a bit less when not certified. It's not a slam-dunk to have this one slabbed though, as there are so many copies on the market. 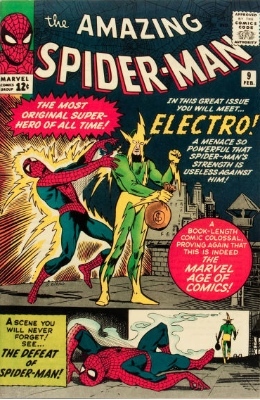 Electro has also been "done" by Hollywood, so right off the bat there is going to be a limit to the upside of his first appearance. The dark blue cover shows wear easily, and so there are significantly less high-grade copies in the census. Surprisingly, the last 9.2 sale was a mere $2,700, which seems too cheap to me. Still, there is some downward pressure on prices at the high end of the scale. Maybe some new copies surfaced and diluted the scarcity of the upper end of the grade scale. Whatever, I'd go with the 9.2 when you can afford it. $350 for a CGC 4.0 seems way too much in comparison to that 9.2 price. You'll pay about the same for a book not in a holder. Save up for something better. 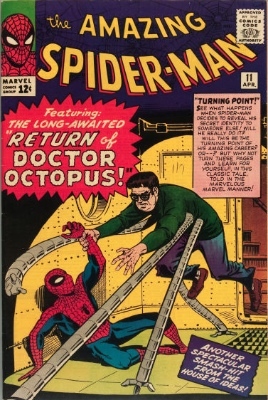 This is as close to an unpopular back issue of Spider-Man comics as there is. It always seems to be in every collection. It's never very nice when it comes in. The pale green gets grubby very easily. FN is about the median grade for this book. It's worth under $300 in a CGC holder in that shape, and about the same not certified. Not a book I really would recommend investing in. Still, there is recent upward pressure on prices in higher grade. Maybe the market knows something is coming for this issue? Last sale of a CGC 9.2 was $1,700. I'd say that is a reasonable gamble if you can find another. 5.0 seems to be the average shape for this book. If you've got a copy in that shape, it's worth $250-350 in a CGC holder and a bit less if not certified. Prices seem to be upwardly mobile on this book across all grades. For investment purposes, there is an enormous jump between 8.5 (VF+) and higher grades. There simply are very few high-grade examples in existence. The gap in price between 9.4 and 9.6 is pretty small. Neither is affordable for most people. You should be able to find a 9.0 for about $3,000, which is a good bet. 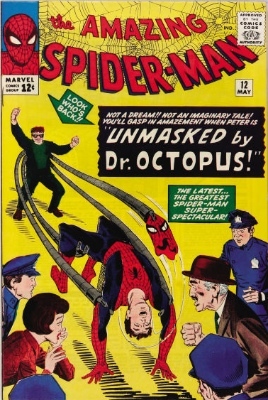 In this issue, Peter Parker's identity is "revealed" for the first time in public. This issue is much more common than #11 in high grade. Average condition of this book is around 4.5 to 6.0. It's worth about $200 in a CGC holder and won't cost much less if your example isn't certified. A CGC 9.2 will cost you less than $2,000. 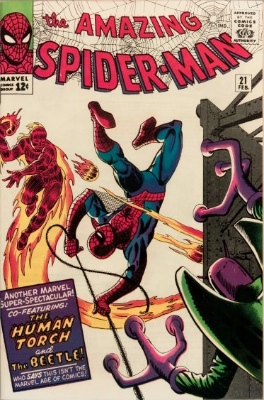 That seems like a pretty cheap price for such a high-grade Silver Age Spider-Man comic book. This is a much tougher book to find in high grade. Every copy we get seems to be a rag. 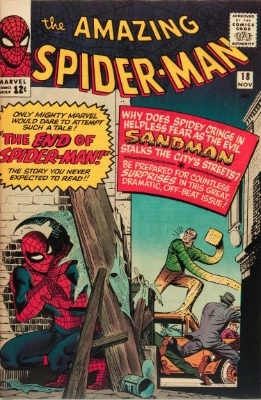 The white-tone cover shows any dirt and grease. This book is heating up, with upward price pressure on most grades 5.0 and better. It's hard to pin down prices on a book that is suddenly popular. 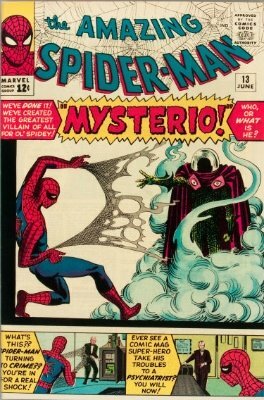 There seems to be speculation about Mysterio and movie appearances. You could pay $200 for a 4.0 and more for a lower-grade book at the moment. Stick to high grade if you're looking to invest. I'd recommend an 8.5, which currently is not much more expensive than an 8.0. 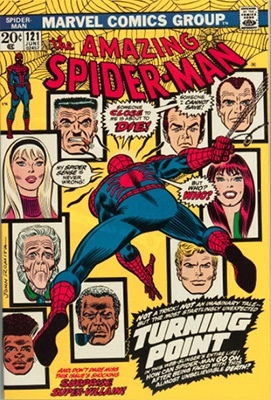 Amazing Spider-Man #14 is on our 100 Hot Comics list. Click to find out why! 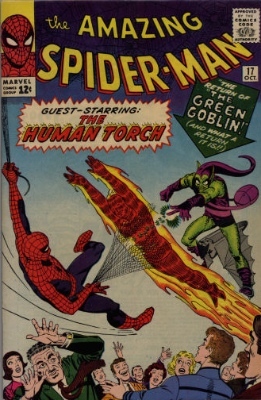 There aren't many bigger Amazing Spider-Man comics than the first appearance of the Green Goblin. And if any villain is likely to get a reboot, it's GG. We see this book literally in every grade from 0.5 to 8.0. People just want one no matter what, and they'll pay good money to get one. A CGC 7.0 is the entry point for four figures on this book. Last sale at that grade was $1,645. But there is so much price compression that you can get an 8.5 for about $1,000 more. Much better bet if you're in the mood for an investment. It gets really expensive from 9.0 and up. $4K for a 9.0 seems a little pricey to me. 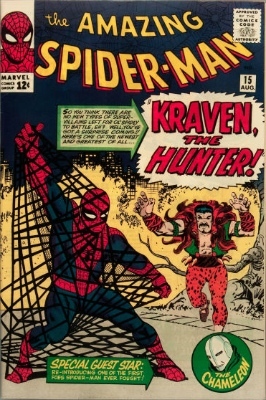 Kraven is probably due his time in the movies, and speculators agree. Which explains the rapid uptick in prices on this book in recent months. 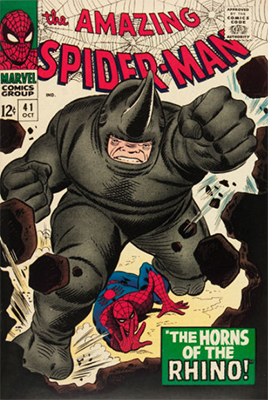 I still find it under-priced in some grades when you consider that it's the first appearance of a major villain who has yet to be tapped by Hollywood. Last sale of a CGC 9.2 was only $2,400. Average condition is about 6.0 on this book. It's worth about $250-300 retail, in or out of a holder, if you happen to have a copy. 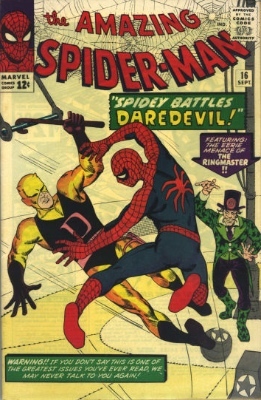 Daredevil the TV series has helped what is otherwise a pretty dead title, and interest in crossovers like ASM #16 has increased. This is a fairly common book in higher grade, and a CGC 9.4 will be less than $3,000 if you fancy investing in one. But I don't fancy this book very much, and prices at the upper end have softened recently. 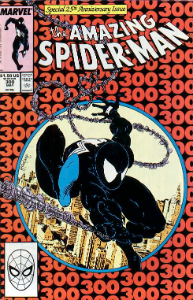 In the mid-grade they usually show up in, ASM #16 costs in the $200-350 range. 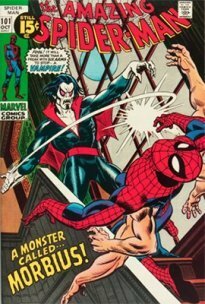 This is a cheap book until you hit VF (8.0) and above, when it suddenly spikes up in value. It's pretty unusual to see this in nicer than FN shape. Again, the dark blue background shows wear very easily. Books in the FN-VF- range seldom break out from $300. It's a $600 in 8.0 but only $1,200 in 9.0. Collecting second appearances has become popular of late, so if you're in the market for GG's second outing, aim for a 9.2 and expect to drop a little under $2K for the privilege. 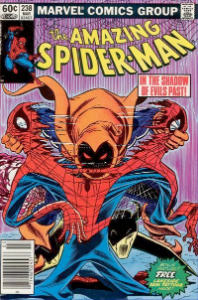 Hobgoblin is hot. 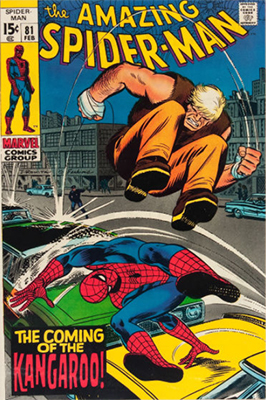 But unfortunately, this has not translated into higher prices for the first appearance of Ned Leeds. If you bought a CGC 9.4 as an investment in 2014, you would still be patiently waiting to turn a profit. This is a pretty common book. It doesn't break the $500 barrier until you hit 8.5. One I tend to get excited about when it comes in because it's often 7.0 or nicer. Then I check the prices and think, Oh... Shame. The white cover of this issue means it's pretty near impossible to find a really clean example. All the ones which come in tend to be some shade of dirty cream color. Another cheap book in mid-grade, with CGC 6.0s changing hands for around $140. There is almost no price difference between a CGC 9.2 and a CGC 9.6! Last sale of a 9.2 was $1,000; last sale of a 9.4, $1,160; and last 9.6, $2,200. I don't like this as an investment. The final book in the initial run of 20 sees another first appearance. The Scorpion will cross stings with the spider many times over the years. There is a lot of positive activity on this book. 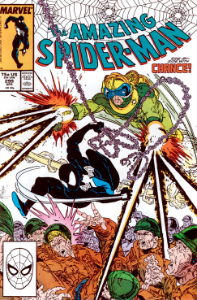 Speculation is rife that Scorpion might be the sting in the tale of the new Spider-Man movie reboot. I often see this book in the 6.5 to 8.0 range. It's heating up in FN and above. A CGC 7.5 is now touching $500. For investment, I'd aim higher and drop $1,400 on a CGC 9.2. Last sale of a 9.4 was over $3,000. Click any of the links below to find out the values of these issues. We have divided them up into blocks of 20 for easier reference. 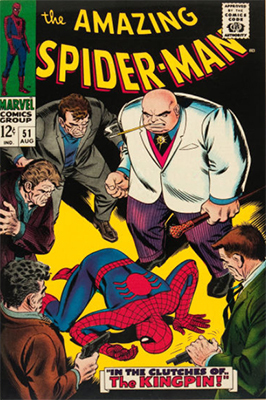 All early issues of the Amazing Spider-Man comic are worth good money. There are some really "key" issues though, and we're going to highlight those in the Top 10 list below. We've also put some images of various comics that you often come across in classic collections to help you identify what you have. Find out their current values! 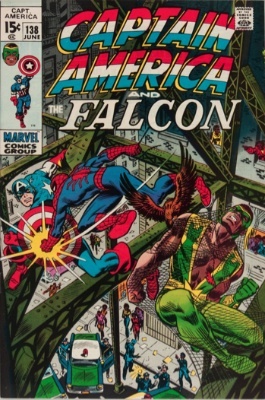 Click any of the links to see LIVE prices on comics for sale today. Click any link to see live prices on REAL comics for sale. 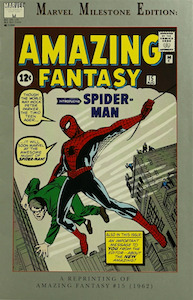 The origin and first appearance were in Amazing Fantasy #15. 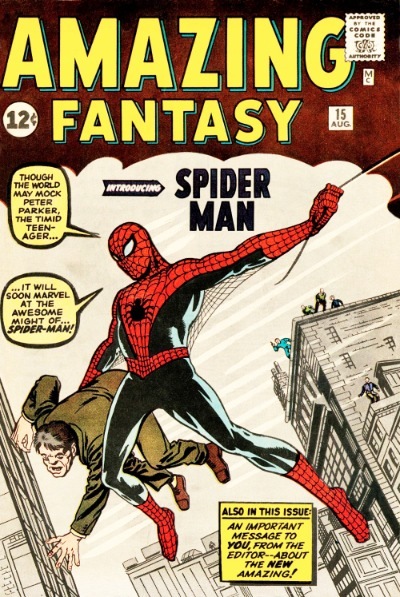 Click to read our complete article on this famous comic book. Even if you don't have any of those key editions, you could still have a nice collection. Here's a simple way to work out what your old Amazing Spider-Man comic collection could be worth. Add the key issue prices, above, if you have any of them, and you can quickly come up with the LEAST your comics will fetch for you! Click the links to check current values. Here are some other more minor key issues. They are gaining value rapidly, as collectors seek top-condition copies for their collection. The important thing to remember here is that more modern comic books MUST be in almost perfect shape. There are simply too many copies on the market to make it worthwhile buying sub-standard copies. 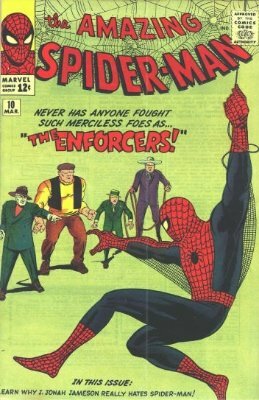 The Good News About Spider-Man Comics! The really good news is that Spider-Man comics are the world's most collected title. That means there are always buyers for your old Spideys, no matter what their condition. Get in touch with what you have and we'll work out a value for your books, and make a Dollar offer if you are interested in selling them. Learn the value of key issues of the super-team, including the Spider-Man crossover in Avengers #11. Got comics? See values for X-Men, Iron Man, Avengers, and many other Marvel heroes. 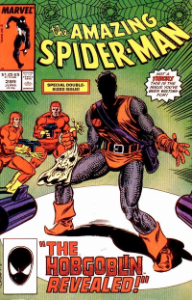 Learn how much the first appearances of the worst Spider-Man enemies are worth! Hot movie rumors have driven up prices. Learn how much key appearances of Doctor Strange are worth.